When poured into a clogged drain liquid ONE SHOT instant drain cleaner goes to work instantly. Dissolves grease, rags, soap, and paper towels. Clogged pipes can be money literally down the drain! ONE SHOT should be used as a preventative maintenance product on a regular monthly basis and you will not need expensive professional help.
" Quite simply the best and most effective drain cleaner in the country "
ONE SHOT can be purchased at plumbers merchants and hardware stores in the United Kingdom. We welcome all trade enquiries - please use our contact form to get in touch with us in the first instance. Useage: Use monthly as a preventative measure. Unclogs blocked drains. Works on: Grease, rags, hair, soap and paper towels and other sink and drain blockages. If your toilet is blocked, ONE SHOT can help to unblock it. Use as directed for best results. Bath not draining quick enough? You suspect the plug hole is blocked by hair - try ONE SHOT. Made for bath plugs. Sink hole blocked? Got grease trapped in your U bend? Use ONE SHOT to remove it. 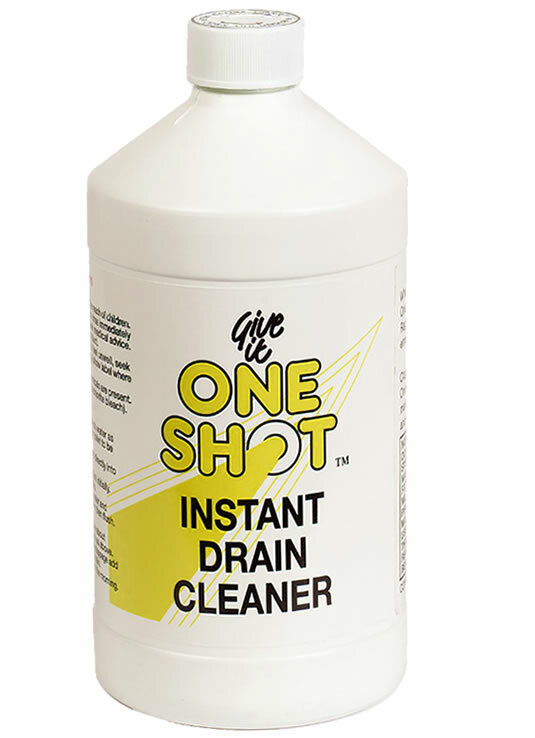 ONE SHOT is the original and best drain cleaner available in the UK. ONE SHOT has been sold throughout the UK for over 33 years. Tried, tested and trusted, the ONE SHOT brand of drain cleaner has been used by generations of people to save money and keep their drains flowing. Over 1,000,000 bottles of ONE SHOT drain cleaner are sold every year. Shouldn't YOU be using it to save you time and money. These are just a few examples of the letters/emails and reviews we get about ONE SHOT Instant Drain Cleaner. I had pretty low expectations, having used various supermarket type unblockers in the past (I get blocked drains a lot since the previous owner managed to install all the drain pipes running slightly uphill). I should not have been so pessimistic. It worked, just as it says - almost instantly. Poured in and you can hear it fizzing in the pipes (it says wear gloves - do, it doesn't sound like it would be fun on your skin). Flush through with cold water and job done. Took less than a minute to sort a completely blocked solid pipe. Only drain cleaner you'll need! After reading the reviews about this product I thought I may as well give it a try before calling for reinforcements. The outside drain from kitchen to rest of sewer system was blocked solid. Tried rodding but access prevented this, tried wire wound drain cleaner to no avail. Siphoned out a litre of water/sludge and poured a bottle in. Within seconds things were gurgling then level lowered slowly. Poured bucket of water slowly down and within minutes the drain was fully cleared. Bucket of water went away instantly. Wouldn't have believed how good this is. Had a call from a tenant at a flat I rent out saying the kitchen sink was blocked. Bought this on a recommendation from a colleague. Poured half the bottle down the drain and could immediately hear a gurgling as the blockage cleared. The U-bend got warm to the touch as it went down which to me was proof that it works. I ran some water and then poured the rest of the bottle down and everything started clearing normally. Has saved me calling a plumber! I bought 2 bottles as they were on 2 for £10 and I've left the second with the tenant to use every couple of weeks as a preventative measure. Definitely worth giving a try before you call a plumber. Bought this product today. We moved into a private rent home last week and found the bath to empty REALLY slowly, tried pulling the hair out by hand, to no avail. Used this as directed, 5 minutes, 125ml one shot, after 5 mins, 150ml water, another 5 mins then flush out. Worked first time, never seen a drain empty so quick! Immediately call a POISON CENTRE/doctor. Dispose on contents/container in accordance with national regulations. Using a cup, remove as much water as possible from drain, sink or toilet to be treated. Always pour very slowly and directly onto the drain. Sink drains: Use about 125ml initially. Allow to stand for 5 minutes then flush. Repeat if necessary. Toilet and floor drains: Use about 250ml and follow directions as above. Prevention: To avoid future stoppage add 100ml per month in each drain. For best results use early in the morning. Q. Can I use ONE SHOT on a septic tank? Q. Can I use ONE SHOT on a macerator/Saniflo system? Q. Can I use ONE SHOT if I have used other chemicals first (bleach, soda crystals, etc)? DO NOT USE ON ALUMINIUM, GALVANISED METAL, STAINLESS STEEL OR WASTE DISPOSAL UNITS. MAY ETCH ACID SENSITIVE PORCELAIN, ACRYLIC AND ENAMEL FIXTURES. WILL NOT HARM IRON, STEEL, CLAY, LEAD, COPPER, PLASTIC PIPES OR HARM SEPTIC TANKS WHEN USED AS DIRECTED. DO NOT USE WHERE OTHER CHEMICALS ARE PRESENT (PARTICULARLY CAUSTIC OR HYPOCHLORITE BLEACH). READ ALL LABEL PRECAUTIONS & DIRECTIONS COMPLETELY BEFORE USE. THE BUYER MUST ASSUME ALL RESPONSIBILITY RESULTING FROM THE USE OF THIS PRODUCT. We welcome all enquiries for our ONE SHOT product. You can contact us in a number of ways: Please use the contact form below to send us an email or you can ring us direct on the phone number shown below. If you would like to visit us we would ask that you make an appointment - regretfully we are unable to accept unannounced visitors.